A snow storm blew through last night and dumped about 5 to 6 inches here in town. I took the opportunity to try another plein air snowscape, even though the temperature was pretty cold and the wind was blowing a bit. I took shelter next to a building which kept a lot of the wind off me as I painted. This one is close to being finished, but I'll probably tweak the values of the building a little. Hello everyone. 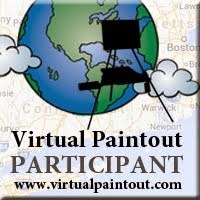 As some of you know I started a project a while back that I call the Virtual Paintout. The purpose is for artists to gather, virtually, in a designated area in the world each month through the use of Google Street View (accessed through Google Maps), and paint or draw a subject of their choosing. The artist then sends me a pic of their work and I post it on the blog. This project has grown quickly over the past couple of months and looks like we might get close to 100 submissions for January. One of the folks that has started to participate is Melinda Campbell. Melinda is an art teacher of sixth grade students in a public school system here in the States. She has integrated the VP idea into her class, and said she was surprised at how many students chose Washington, D.C. and New York City. She said that many chose their on homes as a subject also. And that their behavior was excellent, they were involved, and so quiet you could have heard a pin drop. Melinda also says that she was able to "cross discipline and integrate geography, social studies, math, language arts, history and science in with the art lesson." She sent 10 pics of some of the work, which I'm adding here. I hope you enjoy them. I certainly did. Here's something I've been playing with for a couple of days. Here's one I painted outside today. Sun came out for a minute, but that was about it, so I decided to forge ahead and see what I could do. I've worked on this one for a while now. Finally got over being shy and threw the paint to it the last two days in between laundry, work, and kids. This is a small stream that runs next to Leslie Road and crosses Jackson Hollow Road in Cumberland County, Kentucky. Adding a detail shot of the grasses on the right side. I have been looking at this online compeition, Fine Art Views Painting Competition, for some time, but the quality of the entries always made me hesitant about entering a painting myself. I made the commitment last month and entered a painting for the December 2009 competition, and found out today that I had been selected for the Juror's Favorite 15% of the entries. It didn't place in any of the prize categories but I am very happy with being in the Juror's top 15%! There were almost 700 entries for December, and the Juror, artist Nancy Guzik, certainly had her hands full choosing from all the great art submitted. The painting I entered was "Cows in the Meadow" that I painted from a photo I took down near Dale Hollow Lake State Resort Park. This farm is located in a tiny place called Waterview, Kentucky. This house has sat empty for quite a few years now. I took a photograph of it as I was going down the road one wet day recently, and worked from that. Painted this one down at Dale Hollow Lake State Resort Park this morning. I might use it as a study for a larger piece later. Katherine Tyrrell wrote a post today on The Art of the Landscape blog, about my ongoing Virtual Paintout project. Katherine has another blog, Making a Mark, which is held in high regards around the world for it's informative posts about all things art. I'm very honored Katherine has written this article, and am very happy that she focuses on what I consider to the most important aspect of the project; which is the ability of disabled artists to use Google Street View as a resource for creating Landscape art. Those of us that like to get outside and paint or draw often take for granted our ability to do so. Please go to this link and check out the post. Thank you, Katherine. Looks like today was the last of the snowy plein air pieces for a while. The weather is supposed to turn warmer early this week, and most of the snow was melting this afternoon. I did get a chance to jump down into another part of Cedar Creek today though. This one took about 2 and a half hours. I purposely used the same limited palette and the same size canvas, as I think these last three look good together as a short series. For those interested, my palette consisted of Ultramarine Blue, Cobalt Violet, Golden Ochre, Transparent Oxide Red, Burnt Siena, a touch of Cad Yellow and Mars Orange, and White of course. Went out again today. This time to Little Renox Creek at Salem Park in Cumberland County, Kentucky. It was a bit colder today than on Thursday. The moisture from my breath froze on my mustache and beard a couple of times. Had fun. Painting time was about 2 hours. "Little Renox Creek - Frozen"
Don't you just love this winter weather!? Today was my first experience painting outside in the snow. Not only was it snowing, it was cold, and blowing, and snowing. Did I say snowing? I got my new Cabelas Snowy Range 1200 Pack Boots in the mail today. Just what I've been waiting for. Those puppies are rated to -135F, and let me tell you; I was standing on solid ice for about two hours for this painting and my feet stayed nice and toasty. Love 'em. This was also my first time using my new easel outside. I've been using it in the study the past few days and was very pleased with how it handled, inside and out. It's a Beauport "Gloucester style" easel that was tuned up by the good folks at Take it Easel. You'll also see my new paintbox I made to go with the easel. Closed it's about 4" thick and 20" x 20" square. Opened it's huge. Worked great in the windy conditions today. So here are some pics of my outing. I'll probably take this one further in the studio. It started getting dark and the wind really picked up toward the end. Did this one for the January Virtual Paintout. This month we, our hearty group of artists, are traveling to Corsica, the beautiful island off the coast of Italy. Stop by the Virtual Paintout throughout the month and check out all the great artwork being posted. Last month was Mexico City, where we had more participants than ever before.